Children’s Garden Day School I a full-service provider of day care, preschool, and summer camp services in Hamilton, NJ. In the summer time, Children’s Garden Day School offers a complete and affordable summer camp program in our Hamilton, NJ location as well. We are so excited about our new facilities and our learning curricula. While you’re here, please take the time to get to know our Director, Dave Murray, along with our other teaching and support faculty. We offer modern, as well as time-tested day care and preschool programs for young learners from infant through five-years-old. And our Hamilton, NJ summer camp offers lots to do for curious and adventurous boys and girls from infant through 12-years-old. Once again, thank you for taking the time to get to know us. Please take a moment to browse our website and get acquainted with us. We’re confident your child will enjoy an enriching learning experience, growing with us day by day here at the Children’s Garden Day School. classroom-interior-shotThere’s no better way to make your child’s preschool learning experience a more relaxing, more enjoyable one than ensuring it is had in a pleasant, fun and clean environment. At the Children’s Garden Day School, we too recognize the important roll the right day care and preschool learning climate plays in your child’s early education. Our facilities have been completely remodeled and our accommodations designed to support the continued mental and emotional growth of your little learner. But don’t take our word for it. 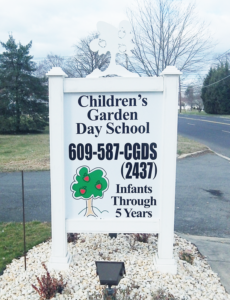 Come find out for yourself why parents all over the Hamilton, and Mercer County, New Jersey area are taking a look at Children’s Garden Day School. To schedule a visit to tour our facilities and meet our faculty and Director, please contact us.